I hold a Level 2 Award in Food Safety for Catering. I am a fully registered cake maker. My premises have been checked and cleared by Environmental Health for the purpose of my business. 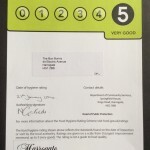 My Food Hygiene Rating is a ’5′ which is the highest rating and classed as ‘very good’. I always use good quality ingredients which are stored correctly and frequently checked for use by dates. Orders are supplied with ‘eat me by’ dates, allergen advice, and storage instructions. My products are baked in a kitchen where nuts are stored and used so I cannot guarantee anything that I bake would be suitable for anyone who has a severe nut allergy. I try and keep colourings to a minimum where possible but if you want a colourful cake there are going to be E numbers in the sponge, icing and toppers. Special Dietary Cakes - I also make gluten free, dairy free and egg free cakes, cupcakes and french macarons. Please contact me should you wish to discuss a ‘free from’ order.